The Iron Horse Park playground has served the community long and well, but it is ready for an upgrade! Following the direction of the 2014 levy approved by voters, the Centerville-Washington Park District is systematically replacing older playgrounds. Work to replace the Iron Horse playground will begin shortly after school starts in August. The new playground will be a bit larger, and will feature an all-weather, all-accessible safety surface. This type of surface has been well received by children and parents at Activity Center and Robert F. Mays Parks. Not only does it meet safety requirements, but it’s easy to walk on, accommodates wheels, and is ready for use even immediately after the heaviest of downpours! Because residents have told us that they’d like to see more shade in parks, the new playground will include a colorful shade structure. Play features include swings, an adaptive swing chair, a wheelchair-accessible whirl spinner, various climbing structures, slides, platforms, and a spinami. 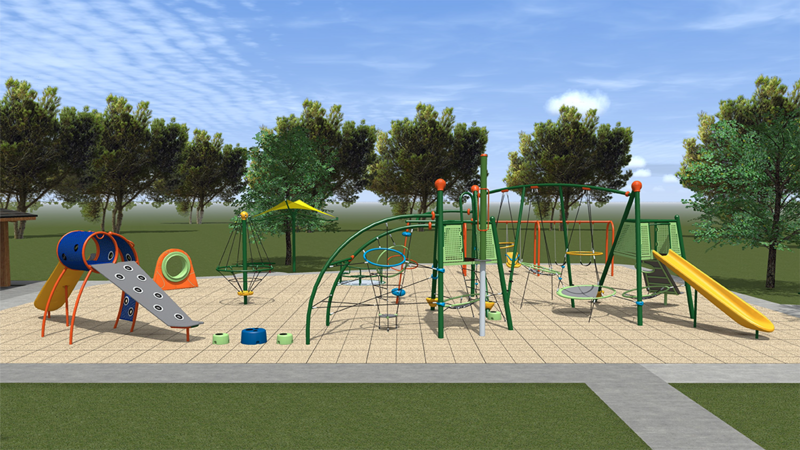 The playground will incorporate fresh, lively colors. In addition, Cherry Hill, Forest Walk and Greene Line Park playgrounds will be getting new, replacement play features this fall. Park District plans include upgrading a few playgrounds each year, starting with the oldest first.